A light in the kitchen caught my eye. I looked at it for a moment: someone had apparently left a candle burning. I got up to blow it out. I knew the dangers of leaving a candle burning all night. As I neared the kitchen, I noticed that the flame didn’t look much like a candle. It was bigger and rounder and it didn’t flicker the way a candle’s flame does. It glowed brightly with a consistent glow and flames leapt out from it like flames on the sun. I stopped dead in my tracks. Where had I seen something like that before? Suddenly, there was movement as I saw what appeared to be long, black fingers curled around the ball. I looked up: looming above me was a six-and-a-half-foot shadow. I felt the Book of Light I was still holding fall out of my hands and hit the floor with a thud. Very slowly, I began backing away—my heart racing. The sombra moved toward me. I backed into a chair and nearly fell, but I kept my balance. I tried to recall a verse from the Book of Light to use as ammunition, but nothing came to mind. It was like my mind was frozen. And the Book of Light was out of reach—lying on the floor in an open position, the way it had fallen. Light was pouring out of it. I reached for my pocket—I didn’t have a pocket. Then I remembered: I had already changed into my sleepwear. The smaller Book of Light wasn’t available to me, either. I looked to my left: Fuego was keeping watch not too far away. I knew that asking him for help wouldn’t do any good; he wouldn’t help me. I could ask the King for help, though. “Father, please help me,” I breathed. The sombra moved in a little closer. I was backed up against a wall now. My armor was in place, and I heard it clank as I hit the wall. The visor on my helmet made it difficult for me to see; I raised it. The sombra took a step closer to me and then stopped. For a moment, I wondered why. Then it occurred to me: the Book of Light was between us. A wall of light separated me from the sombra. The creature would come no closer because it would not come near the Book of Light. The sombra made no move to leave but continued to stand there, silently holding its fireball. Then I remembered something: On that day when I first met Fuego, a sombra had appeared in the living room—not far from where I was standing now. I could not yet see it, but Fuego could and he had referred to it by name—and it left. What had he called it? Engaño! Its name was Engaño! Was this sombra Engaño? Maybe it was, maybe it wasn’t. But there was only one way to find out. “Get out, Engaño!” I shouted. The sombra looked surprised. I couldn’t see its face, of course, but it lost its perfect, military-type stance; it staggered backwards a bit—looking this way and that, then over at Fuego. I couldn’t be sure, but I thought I saw the hint of a smile hidden beneath Fuego’s beard. The arm holding the fireball dropped to its side. The sombra was looking more nervous—and more vulnerable—by the second. When 10-year-old Sara learns that she must spend yet another boring summer with her relatives, she is less than thrilled. 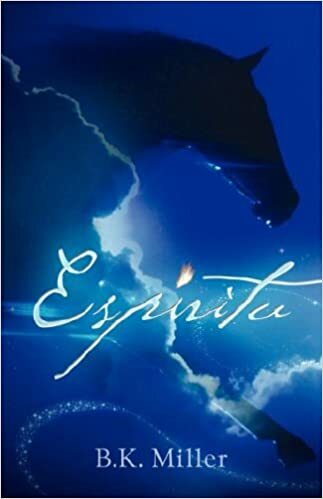 But when the mysterious white horse known as Espíritu shows up, everything changes. Sara is whisked away to the Kingdom of Paraíso--the City beyond the clouds filled with incredible mansions...and a street made from pure gold! Upon returning to earth, Sara discovers she has inherited "the Power of Paraíso" and can now see things "from Paraíso’s point of view." She finds herself surrounded by strange new creatures, some of which seek her destruction. As a warrior of the King, Sara must use the King's armor to battle the shadow-like sombras and help save her dad from their evil influence. Will Sara have the strength to stand? Another summer has gone by and Sara is a year older. As autumn approaches (and Halloween), Sara finds herself a member of a secret club at the junior high. The club’s leader seems friendly enough, but why does she insist that the club remain a secret? And why do the members only meet on the full moon? Little by little, Sara feels herself being drawn in… Meanwhile, Sara’s 8-year-old cousin Jaime is facing problems of his own. His best friend Christopher is bent on breaking the school rules, and Jaime must make the choice between keeping his best friend and doing what’s right. Now that Jaime has become a warrior of the King—having flown to the City of Paraíso accompanied by Espíritu—he knows what choice he should make. But making it turns out to be much harder than he expected. "Like" the Paraíso's Warriors Series on Facebook! Purchase the first 3 books in the series by clicking here! Purchase the newest book in the series by clicking here!